30 second from Bond Street tube station. Experimentation rather than representation is foremost in the mind of David Rickard. Rickard negotiates the role of control and chance in his work by creating a set of parameters that govern the formation of each work. Be it the effect of gravity, the roll of a dice, or even human exhalation, an element of the unforeseeable is introduced and the experiment begins. 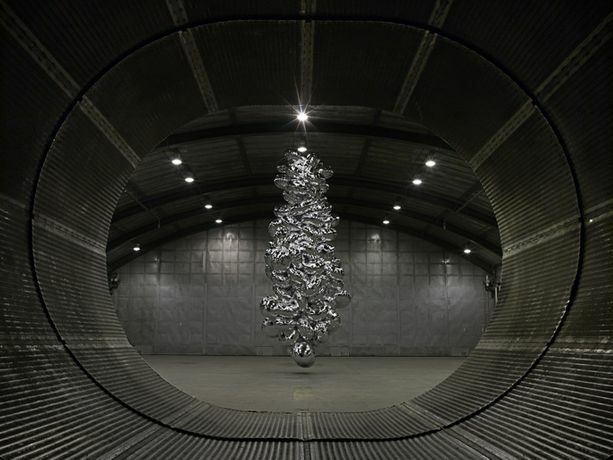 In 'Exhaust' every single exhalation of the artist is carefully collected for 24 hours in a series of large foil balloons. Rickard cannot predict how many of these weightless orbs will be produced, or quite what form they will take as they rest suspended in space. When the process is over all that is left is a gradually deflating sculptural monolith and documentation of the process. A series of large photographs survive as the lasting evidence forming the exhibited work. Considering 'Exhaust' it is hard not to become self-reflective, to become aware of one's own breathing and the vital nature of this basic daily process. Similarly it is plain to see that even at rest we don't exist passively in space, we have a constant demand on it. 'Random Relatives' sees the simple action of rolling a dice define the elaborate growth of a sculptural structure. A fitting motif for an artist so engaged with chance outcomes, the central dice defines the root of an almost organic growth in six directions. The relative position of each sequential rolled dice is defined by the sum of the numbers on the adjacent faces. Following this simple rule 264 times creates an immensely complex three-dimensional matrix within which every component is positioned relative to all others. The work can be read as a monument to mapping, mathematics and structure on the one hand, and to the ever-presence of chance on the other. 'Random Relatives' reminds us that for all our precious structures, nothing is certain. The choice of material is nowhere more potent than in the 'Capacity' series where both elemental and cultural associations come into play. Three shelving units were loaded with reclaimed lead until breaking point and then gilded in 24ct gold. The choice of title refers to the exceeded maximum capacity of the broken shelves and to the elemental capacity of lead to be turned into gold. The gravitational force of the lead changes the structure of the shelving units, a subtle inversion of the force that must be applied to the molecular structure of lead in order to turn it into gold. While now technically possible, this process requires vast amounts of energy at a cost that far outweighs the value of the gold created. With the 'Capacity' series Rickard encapsulates the futility of alchemy; just as the shelves can no longer fulfil their intended purpose, neither can alchemy provide the wealth sought by the hopeful for centuries. The key components of any scientific experiment, control, organisation and an unknown outcome form the basis of Rickard's work but leave more than a result. Through these processes the futility of man's desire to organise, control and comprehend is often exposed and in the 'Capacity' series Rickard goes one step further to demonstrate the role of chance in thwarting human intentions. Rickard's work is not just the lasting trace of a process, but the presented evidence of the role of chance in our lives from a molecular to a cultural level. David Rickard studied architecture at the Auckland School of Architecture in New Zealand, before studying art at Brera Accademia di Belle Arti, Milan and Central Saint Martins, London. Solo exhibitions include Test Flights, Economist Plaza, London (2010), Mitosis, Galleria Michela Rizzo, Treviso, Italy (2009), Exhaust 19-06-08, Goethe-Institut, London (2008), Solid State, Galleria Michela Rizzo, Venice, (2008) and Dilate, Trolley Gallery, London (2007). Group shows include Round the Clock, 54th Venice Biennale (2011), Beyond Ourselves, Royal Society of Science, London (2011), The Wolfson Syndrome, The Modern Language Experiment, London (2011), Exteriority, Sumarria Lunn, London (2010), Appetite for Destruction, NEST, The Hague (2010), David Rickard/RomeuGoncalves, The Mews Project Space, London (2010), The Jerwood Sculpture Prize, The Jerwood Space, London (2005) and Long Live Romance II, Galleria Pack, Milan / Lipanjepuntin, Rome (2005).